Floreat Athena’s fine form continued with a 4-1 win against ECU Joondalup in the twilight game at the E&D Litis Stadium. They had to come from behind to do it, with Gordon Smith giving the visitors the lead after only six minutes. 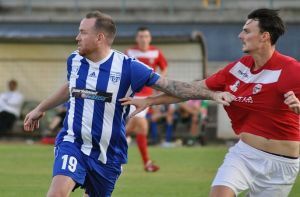 But a second half hat trick from former ECU Joondalup midfielder Jonathan Stynes and another from skipper Ludovic Boi turned the game around, making it five games without defeat for the club. Stynes, who had missed the last three weeks due to injury, said they got a ticking off at the break and responded well. The former Kilmarnock midfielder said it always nice to score against your former club, but a hat-trick is even better. “It can’t get any better than that can it,” he said. “It’s my first game in three weeks, but Glen put me straight into the side, because he knew I was desperate to play against them. Floreat coach Glen Grostate said a few harsh words were said at half time and he was delighted the way his players responded after the break. “We were very poor in the first half, and we deserved everything we got,” he said. Grostate praised Stynes on his hat-trick, and said it was good to get him and Lewis McMahon back in the starting side. “Jon has been out since the opening game of the season, and for him to come back and do that is fantastic, I couldn’t have been more pleased for him,” he said. ECU Joondalup had Wellington Phoenix keeper Lewis Italiano making his debut for the club, but it was their import striker Smith who opened the scoring on six minutes. Good approach work from Paddy Doyle, saw the youngster skip past two Floreat defenders before feeding Smith, and the Scottish striker raced clear and finished clinically past Jason Saldaris. It was nearly two moments later. A superb cross field ball from Doyle sent Bayley Brown-Montgomery down the left, he skipped past his marker and raced into the penalty area, but his shot flew over the top. Floreat were almost gifted an equaliser on the quarter hour. A poor back pass by Ryan Lowry let in Phil Arnold, but Italiano was out quick to clear the danger. Floreat couldn’t get going and almost found themselves two down moments later. A long kick from Italiano sent Smith clear, Jason Saldaris was out quick to clear the danger, but his clearance only found Doyle, whose lob from 20meters hit the post. The home side did end the half well, Clayton Arnez fired just wide, before Stynes and McMahon saw efforts saved by Italiano. It was different Floreat side after the break, and they were level two minutes in. A long ball over the top sent Boi clear. He held off Shane Pickering, before rounding Italiano to score. The game was turned on its head and Floreat scored two more goals in a three minutes spell. First on 53 minutes Arnold sent Arnez down the right and his low cross was turned home by Stynes, before a long ball over the top sent Stynes racing clear and he finished low past Italiano. ECU Joondalup were shell shocked and were struggling to cope with Boi and Stynes, while McMahon was holding the ball up well and bringing players into the game. The icing was put on the cake in stoppage time, when Stynes completed his hat trick. A ball across the penalty area wasn’t dealt with by the ECU defence and Stynes nipped in before Italiano to score, to wrap a comprehensive win for Floreat Athena.